Propsummit.com a Blade Runner Prop Community Forum BladeRunnerProps.comView topic - MK2 Blaster display/storage case interest thread. MK2 Blaster display/storage case interest thread. Posted: Sun Dec 17, 2017 8:46 am Post subject: MK2 Blaster display/storage case interest thread. So, this is the interest thread for the MK2 storage case. This will be the 2nd run, and not those currently on offer. It will differ in a few significant ways. The case corners will be antiqued brass. The badge will most likely be a clear cast amber Steyr emblem. The blaster cut-out will be the same, for the Tomenosuke. The plaque will be the same design. I'm looking at some different materials, though. If you're interested, please say so and I'll add you to the list below. We need a minimum of ten to get the project off the ground. On the list, thank you. 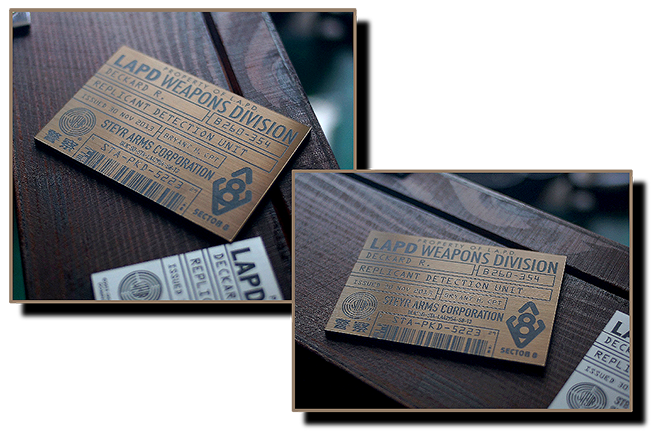 I've been in touch with the supplier and I can get a brushed bronze sheet material which laser etches black. This means we can have antiqued brass corner protectors, leather top, clear amber badge, and a bronze VIN plate with black lettering. Another on the list ! About when might you start requiring payment? Just so I know to check back by then. You're on the list. Thank you. Keep an eye on this thread and I'll keep it updated. Color me interested as well. -Thanks! Skin-job just forwarded a couple of images of the final plaque for the second run - MK2, for you all to check out. No surprises here in that the content has not changed, however the new brushed bronze is a nice alternate to the earlier plaque, and works well against the warmth of the wood. I like it - hope you all do as well. Looks great so far. Can’t wait to see it all come together. Three places remain open for the MK2 run. Hi, just to notify that I'm back from holiday. 7/10 on the MK2 list, looking good! Please tell us when you'll be ready for giving us the payment instructions ! I need to get the MK1 boxes all shipped, then start on the MK2 run. Interested in one Mark 2 Version Box please.